Kislyakov was born in the Moscow area on 20 February 1918 and entered military service at age 21. He was graduated as a pilot at Borisoglebsk military flying school a year later and was posted to the 153 IAP. Kislyakov scored for the first time on 25 June 1941 when he was on patrol over Lake Ladoga in an I-153 spotting a lone Finnish Fokker and shooting it down near Sortavala (N Lake Ladoga). He subsequently excelled in beating up enemy airfields around Tosno, Pushkino and Krasnoye Selo being credited with the destruction of 15 aircraft on the ground but in doing so was shot up by flak on four occasions and downed by fighters twice. He was appointed deputy commander of the regiment and deployed with it to the Stalingrad area. In a series of ferocious battles over the Volga he claimed six kills with Airacobras while the regiment was credited with downing 81 more. The 153 IAP became a Guards unit when it was renamed to the 28 GIAP on 21 November 1942. Kislyakov claimed two Bf 109s on 30 December 1942, while flying a Yak-1. During January 1943, he claimed an Fw190. He next saw considerable fighting over the Demyansk bridgehead and on 23 February 1943 led a squadron to score seven air victories in a running battle with a superior enemy formation. Kislyakov flew his last sorties over East Prussia in 1945. He was decorated with the Gold Star of Hero of the Soviet Union on 18 August 1945 in recognition of 15 victories and 532 sorties. Kislyakov was also decorated with the Orders of Lenin (twice), the Red Banner (thrice), the Patriotic War 1st Class (twice), the Patriotic War 2nd Class and the Red Star (twice). 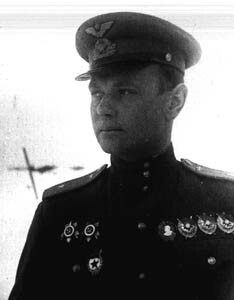 Kislyakov ended the war with 1 biplane victory and a total of 17. These were claimed on 539 sorties. He also claimed an observation balloon during the war. He remained in the ranks following World War II and graduated from the Air Force Academy in 1952. He concluded his active duty with the rank of Polkovnik in 1968. TOTAL: 17 destroyed, 1 observation balloon and 15 destroyed on the ground. (a) Not confirmed with Finnish sources. No Finnish Fokker losses are recorded on this day; the only Finnish loss on this day is a Hurricane in a landing accident at Hyvinkää where the pilot luutnantti Teuri was killed. Additional information kindly provided by Tuomo Lukkari and Ondrej Repka.